Now Reading: Should you pray with an iPhone? Increasingly, society is depending on electronic devices to consume information. Real newspapers are falling prey to online news, which is instant and includes live streaming of breaking events. Hard copy books are being replaced by e-books. Even textbooks and children’s books are going digital. In many ways, this is great. I love my Kindle. The ability to download the collected works of a favorite author for $0.99, or many times, even free, is simply amazing. I also have reading apps on my phone and on my tablet. While I always prefer a physical book (I have an ever growing library of them), the advantages of e-readers compel me to e-books more and more frequently. And I’m OK with that. But what about praying with an electronic device? 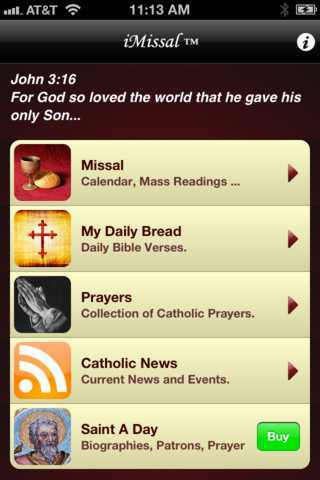 If you have any kind of smart phone or tablet, you know that there are a number of high-quality apps that provide the daily mass readings, libraries of familiar prayers, and even interactive missals and breviaries. Let’s examine some of the benefits and drawbacks of using these apps. The biggest benefit is convenience. Obviously, carrying around a fat daily missal or Bible is more inconvenient than having iMissal on your iPhone. If you have a smart phone, it is always with you. If you have a tablet, it is probably with you most of the time. Books, on the other hand, are usually out of reach when you need them. Another advantage is interactivity. Many Catholic apps include beautiful artistic visuals, music, or narration. Daily mass readings update every day, and you can instantly download the profile of the day’s saint. These are excellent features that are impossible to replicate with physical books. While digital prayer books can be great, there are definitely downsides as well. The primary drawback I see is distraction. If you have a phone or tablet, you aren’t just using it to pray. Chances are you, have Facebook, Instagram, Twitter, email, and Angry Birds installed on it too. The likelihood of getting a notification from one of these apps while you are trying to pray is high. “Our Father, who art in…Tanya liked your photo on Facebook!” You get the idea. Additionally, if you are using the same device to chat on Twitter or look at photos on Facebook, your brain will probably begin to pulse with the infamous FOMO (Fear of Missing Out) the minute you turn it on. Which leads me to my next point. To enter into deep prayer, we need a quiet heart. We cannot truly pray if our brains are a swirling storm of distractions and anxiousness. Because the next “hit” of information is always only a click away, electronic devices by nature create a restlessness of heart and an impatience for the next new thing. Studies have shown that screens stimulate our brains rather than calm them, and that’s why many sleep specialists recommend avoiding technology for at least an hour before bed. In short, your iPhone does not facilitate the deep concentration needed for communion with God. Considering the benefits and drawbacks of electronic prayer apps, should we use them? My answer is yes and no. Yes, in the sense that prayer apps can be a great way to “sanctify” your phone. If it isn’t possible for you to carry around a missal or a prayer book, by all means, use an app. Reading the life of a saint or stopping to pray with an app is certainly preferable to not praying at all. But that said, I contend that electronic devices should never be our first choice for the reasons mentioned above. Prayer, if it at all possible, should be unplugged. If we want to pray, really pray, we need to calm our hearts and minds and fight distractions. I do not believe electronic devices help us do that. If the saints complained of distractions at prayer in peaceful, cloistered monasteries (which most of us would find highly conducive to prayer), it is certainly much harder to pray with the same iPad we use to check the news and browse Facebook. I have a leather bag I carry with me most places, and it always contains my two favorite prayer books. If I am caught without them, I use an app, but that is very rarely. These books are becoming old friends that I turn to frequently. I miss them when I don’t have them. What about you? Do you prefer praying with electronic devices? Do you find them distracting? 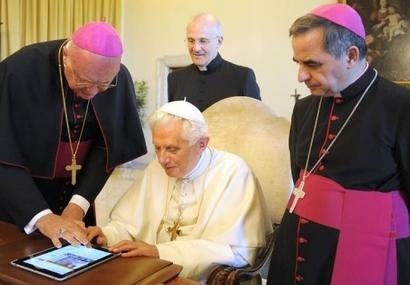 PS: I recently spoke to a Bishop who said that electronic altar missals are not allowed during mass. Can anyone confirm this? Do you prefer praying with electronic devices? NO. Do you find them distracting? YES. I can’t STAND it when people use their smartphones in Adoration. It’s even worse when cell phones ring during Adoration – that scares the living daylights out of me and really ticks me off. Sorry for being so blunt but it’s the truth. I am going to be 68 soon. I have a lot of floaters in both eyes, and cataracts forming in both as well. For seniors with vision problems, I believe the Kindle is a Godsend (pardon the pun). I have an expensive and beautiful missal and bible, but the print (allegedly large) is hard to read, they are getting heavy to hold, and I get frustrated trying to read concentrate while trying to look beyond the floaters. E readers can adjust the back lighting, the text size, etc. So, I believe they are a welcome option for the elderly and visually impaired, and should not be looked upon as a distracting to others for being used. I pray with my smartphone most of the time. After reading this article, I think I will start turning to the standard paper Bible and Divine Office. I hadn’t considered the quietness that is needed for prayer above convenience. We are to be in communion with God, not the next notification that comes across our screen or phone call that might come in. It is like starting a conversation with a loved one, and then ending the conversation when the next distraction comes along. Very rude! We wouldn’t do it to a loved one, why God? …he wrote on his blog, which was read on an ipad. I think most people don’t realize that the book, the printed word itself, was once very, very high tech. They were ground breaking and history altering. Books were the iphones of the 15th century. That they are commonplace a few hundred years later makes this fact lost on many people. If you like “real” books, so be it. Read them. But most everyone who says a Kindle or reading on an iphone is bad, or somehow takes away from the experience, hasn’t really used them. I am personally not distracted by other things when I read on my phone. I find the Laudate app amazing. Two Bibles, the Catechism, the Missal, hundreds of prayers, virtual rosaries, daily readings, saints of the day, stations of the cross, encyclicals, etc, all at the tip of my finger and all in my front pocket. I use it everyday and I read more because of it and the Kindle app. And the Kindle app is accessible over multiple devices. Start reading on my phone, pick up my ipad when I get home and it remembers where I was in the latest Scott Hahn book. Amazing. Much easier than lugging 15 pounds worth of books everywhere. This is just new tech and the push back against it is understandable but not really founded on anything except that it’s new. I fully agree it’s wonderful to have access to so many books all at once via electronic means. There’s nothing like using online resources to hunt down information. Anything meriting further study, of course, I usually print out and work from a printed copy 🙂 Reading printed books is certainly high tech, compared to manuscripts and scrolls, needing quite an adjustment, back in the day. The “great experiment” of reading solely by electronics is being faithfully carried out all over the world. It remains to be see what effect reading via screen will have on the eyes and brain in the long run. Where I can read for hours from a book, I cannot do the same with my computer monitor or handheld. I pay for attempts at long screen time with posture and blurred vision after awhile. More to the point, I don’t find my connection with God is the same electronically as it is with the printed word. Maybe that’s me. To each one’s own. . . I don’t know about altar missals, but I heard that an electronic lectionary would not be allowed. Something about how it has to be “set aside” for that specific purpose, and since e-readers (and especially tablet computers!) tend to be multipurpose devices, they would be inappropriate. I imagine the same would apply to an altar missal. Here are some related links! I bought the iRosary app when I was new in the faith because, ironically, it was less distracting that using a paper version of “How to Pray the Rosary.” I didn’t like fumbling back and forth through the pages while I tried to learn the Rosary. It could be a generational thing, but even when I pray using the iMissal, I am not distracted or tempted in any way to check Facebook or my email. My notifications are always off because I hate getting annoying alerts all throughout the day. Yeah, I agree with this completely. Having the smartphone or tablet is okay because it allows you access to a whole range of good options- prayer and spiritual reading, but really it is a huge distraction. That being said, I do use my iPhone to pray the rosary when I am struggling with the prayer. I have a wonderful app with audio that I just turn on and pray with. Also, I have another app, called “Mea Culpa,” that can be used for Confession. I don’t take it into the Confessional with me, but I do use it during the week for my daily examination of conscience and I can keep track of what I need to confess in my confession. Although, I still take time to do an examination in church to listen to the Holy Spirit and see if there is anything else that He says I must confess. Though I appreciate all the downsides to using my iPhone during mass or when praying with a group, I am mature enough to put my device into Airplane Mode during these moments. I LOVE following the Sunday readings in mass. It keeps me focused on the words and doesn’t allow my mind to wonder. As for praying specific Catholic prayers I need my device to help facilitate these prayers. Over time I am able to memorize them and then I don’t need the iPhone as much (the Rosary for example). I will also use prayer apps when praying for specific things or people. The convenience of having everything available in such a small device has helped me grow in my faith. Electronic media is here to stay and if the Church desires it’s members to learn more and more about the faith we have to allow these devices into mass and prayer times…as long as they truly are not a distraction. There is something unique and (EXTRAordinary) about a good old-fashioned, paper bound book! Electronics certainly have their uses I readily admit. For cultivating a relationship with the Holy Spirit, however, there’s nothing like a precious book of prayers. Nothing short of printed out prayers made into a little booklet will do. Imagine your descendants oohing and ahhhing over a scratched up, beaten up old electronic device with prayers (if it still works) versus a small worn leather (or leather-like) bound book with illustrations and quaint (font) writing. Which do you think you would hold with more reverence? I appreciate being able to pray the Rosary, Divine Mercy or listen to Bp Fulton Sheen etc while driving. I also use the apps for daily Mass and am not distracted as I have notifications turned off. The wealth of Catholic blogs, prayers, books and articles available, means I am always able to be inspired on the bus, waiting to collect children etc. I would not be without my iphone!